Giving blood at Mayo’s onsite blood bank has become a regular part of Michael Cape’s life. 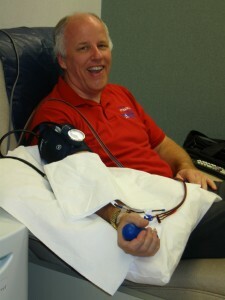 He donates platelets every other Tuesday at 6 a.m. at Mayo Clinic in Florida’s onsite blood bank. So far, he has donated a total of over 59 gallons, making him one of the blood bank’s top donors. “Donating is important to me because I feel like everyone should contribute to the community in some way,” explains Cape. “I choose blood donation as my civic service.” Cape donates platelets every two weeks. Platelets are blood cells that help control bleeding. Usually, those in need of platelets are cancer or organ transplant patients who have weakened immune systems. Thomas Bucher is also a top donor at Mayo’s blood bank. Like Cape, he donates platelets every two weeks at 6 a.m. “Why shouldn’t I do it?” is his sentiment toward donating. “People are in dire need of platelets and there’s only one way to get them – through donors.” Bucher has donated 12 gallons during the past 3 years and has just had his 100th donation. The blood bank at Mayo Clinic is operated by The Blood Alliance, the sole provider of blood and blood products to our local hospitals, including the hospital on our campus. The Blood Alliance relies on volunteer donations to meet the increasing local demand for blood. All the blood donated through the Blood Alliance benefits local patients in area hospitals. To donate, you must weigh more than 110 pounds and be at least 17 years old. During the process, you’ll need to complete a brief questionnaire to make sure blood donation is safe for you and the recipient. Monday, Wednesday and Friday: 8 a.m. - 5 p.m.
Tuesday: 6 a.m. - 3 p.m.
For more information, call 904-953-6516 or visit MayoClinic.org/donate-blood-jax. You can call to make an appointment or stop by for a walk-in appointment. 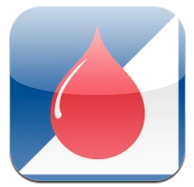 Information on the Blood Donor Program at Mayo Clinic in Rochester. Get iDon8, the official Blood Alliance app for your smartphone.